In preparation for President Obama’s presidential library, two sites in Chicago – one in New York and one in Honolulu – were proposed as possible locations. The choices made by the president and his advisors about the library’s location, design and function will help shape his post-presidential legacy. 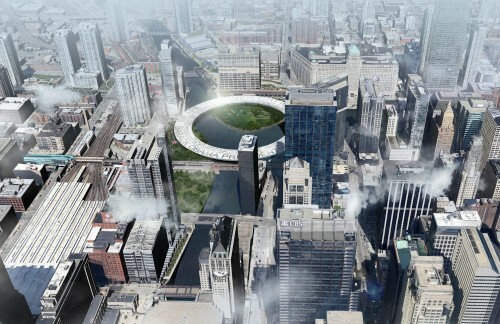 In order to foster debate about the use and purpose of this unique building type, the Chicago Architectural Club challenged local architects to rethink and redefine the Obama Presidential Library on a hypothetical site in downtown Chicago. 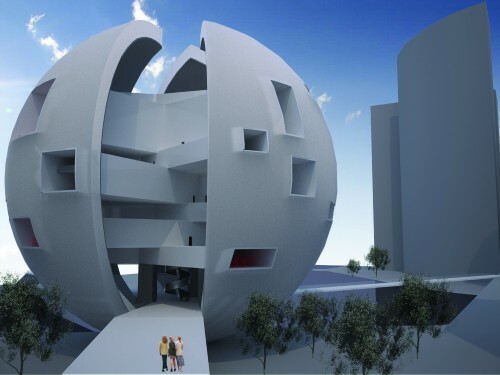 This exhibition features winners and honorable mentions of Chicago Architectural Club’s 2014 Chicago Prize design competition. Winners of the competition were announced at the opening reception of the exhibition at CAF on Feb. 3, 2015. The Barack Obama Presidential Library is designed to reflect President Obama’s charisma, while maintaining and showcasing the identity of the urban grid and river system. The designers fully utilized the roof as a “fifth elevation,” which would be visible from the surrounding skyscrapers. The library would have exhibitions divided into six sections including: early life and career, legislative career, presidential campaigns, presidency, public image, family and personal life. Visitors would experience each section by walking along or between six parallel tracks allowing them to examine different aspects of the president’s life at the same time. The primary function of the Barack Obama Presidential Library would be to serve as a public forum and archive of his years in office, rather than as a memorial. The building would be divided into eight levels of differing heights, with openings offering various views of Chicago. Each level archives a single year of Obama’s presidency. 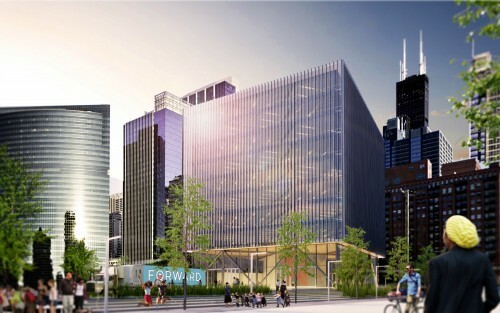 The amphitheater at the base of the building is designed without any glass or walls and would provide Chicagoans with a public forum for free speech. The ground floor of the library is shaped like a peace sign to represent the hope felt during Obama’s first year in office, and serve as a bridge connecting the three riverbanks. The peace sign shape changes on each level, representing the distortion of hope over time. Libraries and museums no longer simply store artifacts and books. They host educational and civic programs, provide flexible spaces for exhibitions and help revitalize communities. Presidential libraries have the added challenge of representing a president’s legacy. An open public square would connect the city, river, train tracks and street level. This terraced slope would be dotted with small private platforms, open-air exhibition spaces, ramps and stairs that make it accessible from all directions. The ground level and interior exhibition and library space would be organized along the same design principles, creating a sense of intimacy and openness at the same time. The typology of the presidential library is fraught with formality. Analysis of the other presidential libraries shows architectural and operational commonalities. These libraries are motivated by a dual-purpose: ensuring the preservation of historic materials, while making them available to the public. 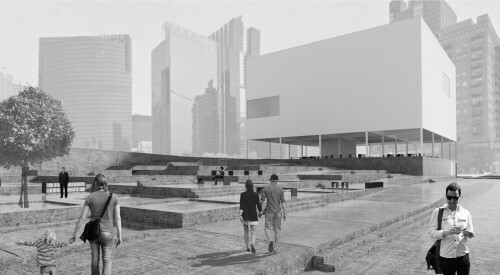 The new Archive Building would act as a storage center and serve as a hub for a system of mobile galleries. A fleet of trucks would be outfitted with touch screens filled with content from the archival core. Each morning the trucks would leave the hub and head towards stations throughout the city. These mobile archives are meant to redefine the way people “visit” the museum: from a static, historic expression of the president’s legacy to a responsive piece of infrastructure that redefines itself alongside the city. 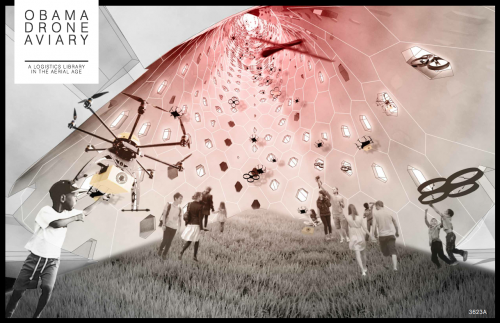 The Drone Aviary doesn’t lock artifacts away – it collects and disburses them. President Obama’s legacy, the population and automation of the skies, would be the critical operation of his presidential library. The Obama Library drones both collect and distribute information. They can scan agricultural production, monitor the climate and follow former presidents for live updates. Teachers can also borrow the pen used by Barack Obama to sign the healthcare bill by requesting that the library send it– via drone – to their classroom. Artifacts remain tucked into the aviary wall until called upon for delivery. At street level, a sculpted landscape serves as a neighborhood park for visitors who watch the drones in the tower above.